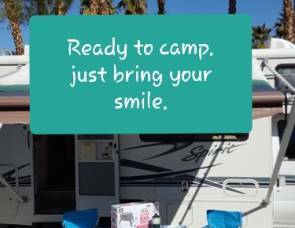 Leisure RV Rentals is not associated with RVshare. 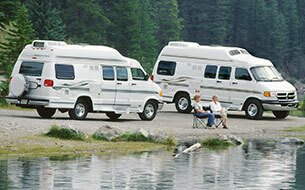 This page is simply a resource, providing more information on all RV rental options, including Leisure RV Rentals. So, you’re thinking about renting an RV for your vacation or other needs, right? At least, that must be what brought you to our website! 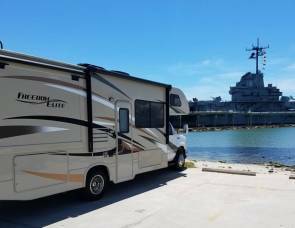 Well, you’ve made a good choice; renting an RV is an affordable way to travel and a comfortable way to camp. If your plans include a road trip, you’ll save hundreds on travel expenses, and you won’t have to deal with booking flights and hotels. Best of all, you’ll get to see everything the country has to offer and make some memories along the way. Big chain rental services tend to specialize in just a few types of RVs, so the selection may not be as diverse as you’d like. However, they usually have the facilities to offer one-way rentals and factory delivery specials, which is rare with other services. Also, keep in mind, customer service isn’t very consistent with big chains; sometimes it’s great, other times, not so much. One big drawback to commercial rental services is the hidden fees that customers often complain about. You’ll need to read the fine print carefully, so you don’t get nickeled and dimed. Small, privately owned rental services are known for their customer service, as with most small businesses. If you like that warm and fuzzy feeling, a family-owned service will provide you with it. The only drawback is that their inventories may be smaller and older since they have to keep up with the financial overhead. You likely won’t have to worry about hidden fees with a smaller company. If you do get a surprise charge, however, it’s a lot easier to debate it with a small company than with a busy chain service. Peer-to-peer rental networks are in a class of their own. There’s no middleman here; you’ll rent your RV directly from the owner. That means you’ll see RVs of every kind imaginable, from vintage trailers to brand-new luxury diesel pushers. Since you rent directly from the owner, rates tend to be lower (and you can negotiate). Furthermore, you’re very unlikely to encounter surprise fees, since rates and rules are included in each listing. However, you’ll be hard-pressed to find one-way rentals on a P2P site. Leisure RV is a family-owned and operated rental service out of Loudon, New Hampshire. Established in 2005, they’ve made quite a name for themselves in just 11 years. Many of their customers come back each year for their RV needs. They specialize solely in renting out trailers, so you’ll need to look elsewhere for leisure travel van rentals. 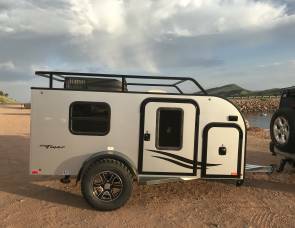 Travel trailers offer a few advantages over other classes of motorhomes, including more space and affordability. They have three styles of travel trailers for rent: one 26-footer and two 29-footers. All units have one full or queen sized bed, up to four bunks, and several convertible sleeping areas. Make your reservation as early as possible. Leisure RV Rentals is a small company, so their rentals go fast. Plus, you’ll save money if you book far in advance. You’ll need to put down a $300 deposit to reserve the RV. Once you pick up the RV, they’ll hold onto that money as a damage deposit. You’ll get it back as long as you obey their rules and don’t damage the rig in any way. They have strict non-smoking and no pets policies. You may have rented from RV services in the past that will let these slide, but Leisure RV won’t! If you break the rules, they’ll keep your deposit. You’ll get a full tank of propane, a tank of water, comforters, and basic necessities for free. You’ll need to bring other supplies, like cooking gear and towels. If you want a generator, you’ll have to rent it from them. Whether you rent from the location directly or have the RV delivered, they’ll take the time to get you used to the rig. Each rental includes a personal orientation, a walkthrough of the vehicle, and a demonstration of how everything works. If you get the camper delivered, they’ll set it up on the campsite for you! They’ll come back and break everything down for you, too – they even dump the holding tanks. The owners give you their cell phone numbers, so you can call them any time of day or night if you have a problem with your RV. 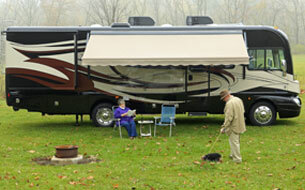 Leisure RV is one of the more popular RV rental services for events and productions in the area. They often rent their trailers for weddings, during Laconia Bike Week, for local festivals, and more. If you plan on staying in one location for a while, they might be a great option. 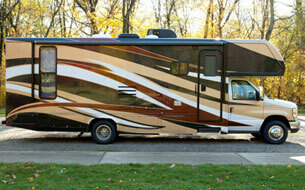 However, if you’re looking for a motorized RV, you’ll need to look elsewhere. 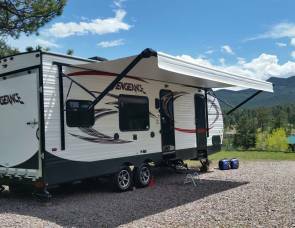 Leisure RV has a few unique features that you won’t find with many other RV rental services, like delivery and setup. Since they’re family-owned, their customer service is more personalized than big chain rentals. 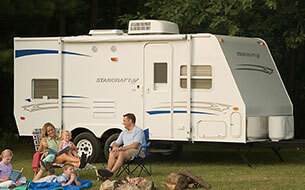 Furthermore, the number of repeat customers speaks to the quality of their customer service and condition of their RVs. However, since their selection is so narrow and specialized, you may have trouble finding what you need.